Our journey to where we are now – wherever we are now – took an amazing 200,000 years and started in east Africa. That, according to modern science, is where and when life began for us Homo sapiens. From there, before nation-states were invented, when the only barriers to free movement of people were the harsh realities of natural rather than state boundaries, humans began their global travels from Africa about 60,000 years ago. Ten thousand years later - some 50,000 years ago – those first migrants arrived in Australia. At around the same time, a second group of migrants crossed the Red Sea. By 35,000 years ago, our ancestors had set-up home across the Middle East and Central Asia. It was not until 40,000 years ago that humans first made it to Europe. Shortly afterwards Neanderthals – our closest human cousins – became extinct. Some 25,000 years ago our fellow humans endured the Ice Age. It was 15,000 years ago that people first crossed the Bering Strait to the Americas. About 12,000 years ago the Agricultural Revolution began, transforming the fortunes of humans forever. And today, here we are, a planet populated by 7 billion humans, including you and me. Nationality? Such a transient almost meaningless concept. Our ancestral humans carried our DNA through a treacherous continuum of time to reach us; across huge expanses of lands that for most of the journey knew no name and needed no passport; who spoke many different dialects and languages we wouldn’t understand; who experienced being different nationalities and races along the way; who mixed and intermixed to create a potpourri of humanity; whose relay-race through the past made it possible to deliver us to the present. Nationality? We are all nationalities. Race? We are all races. We are all the sons and daughters and the brothers and sisters of the millions of humans before us and the millions of humans around us. What’s important isn’t the temporary nationalities of our fathers, grandfathers and forefathers. What’s important is that we have survived and arrived from our 200,000 year journey across the planet to reach where we are now. 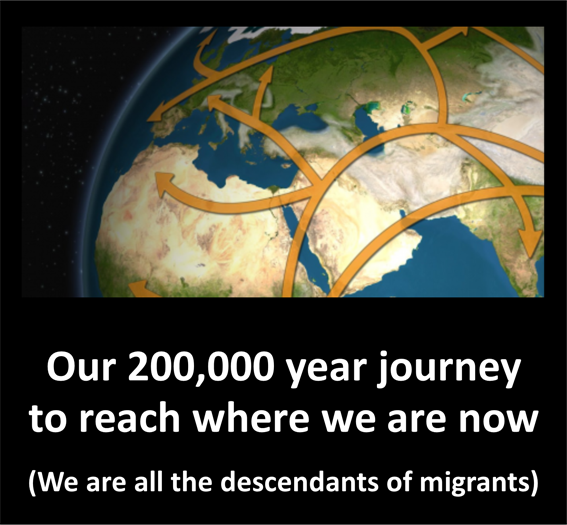 We are all the descendants of migrants.